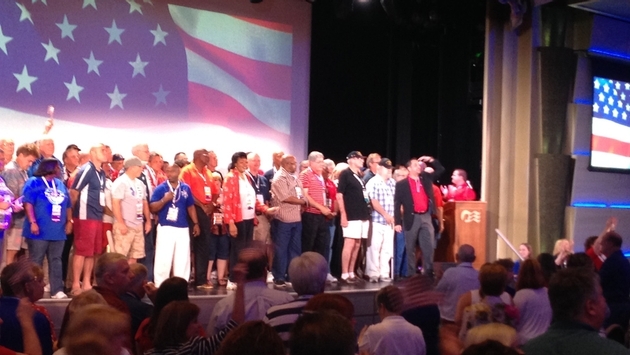 CruiseOne, the home-based travel agency franchise network, honored the many veterans in its ranks Nov. 11 during its 2014 national conference aboard the Regal Princess. Ranked by Military Times as No. 1 on the “Best For Vets: Franchises” list and a top franchise for veterans by Entrepreneur, CruiseOne says that 30 percent of its franchise owners, partners and associates are veterans or active military spouses. In sister company Cruises Inc., a network of independent contractors, the figure is 12 percent. About 100 veterans and military spouses are attending the national conference and were honored in a moving tribute by Tim Courtney, vice president of franchise and network development for CruiseOne and Cruises Inc. He called them up on stage as a slideshow displayed the agents’ personal photos from their active duty days. Many wore red, white and blue in honor of Veterans Day and were saluted by a standing ovation from attendees. CruiseOne sponsors an annual contest called “Operation Vetrepreneur: Become Your Own General,” which awards five free franchises, valued at $12,700 each, to U.S. military veterans each year. It also offers a 20 percent discount for U.S. military veteran owners and additional incentives for hiring veterans and active-duty spouses as associates. CruiseOne’s other military accolades include a No. 1 ranking by Forbes in its “Top 10 Military Friendly Franchise,” inclusion on USA Today’s “50 Top Franchises for Military Veterans” and recognition as a “Top Veteran-Friendly Franchise” by U.S. Veterans magazine. 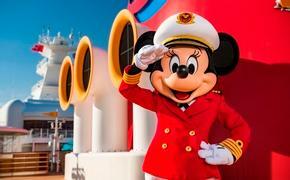 For the past four years, CruiseOne was named to G.I. Jobs magazine’s “Military Friendly Franchises” list, which represents the top 10 percent of the nation’s franchises that are doing the most to support military veterans.